Karlo is a sans serif typeface created by Sofie Beier and published by The Northern Block Ltd. which is available in 22 styles, 3 widths (Open, Serif, Sans) each with some weights. Karlo Open it comes in Regular & Italic and it gives you the impression that you are writting with two pencils once. Karlo Sans & Karlo Serif it has each 5 weights (from XLight to Bold) and italics. This calligraphyc font it merge well on editorial use, text, diplay sizes but also on web. Have fun! Foundry: The Northern Block Ltd.
Price: starting from $28,95 for one font to $ 395,00 for all 22 fonts. 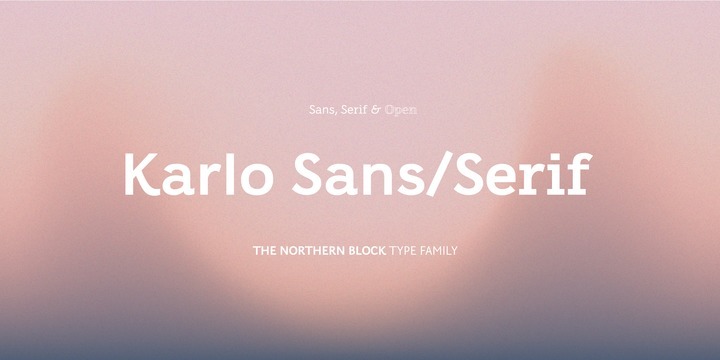 A font description published on Monday, January 29th, 2018 in Fonts, Sofie Beier, The Northern Block by Alexandra that has 2,616 views.